Department of Gastroenterological Surgery, Cancer Institute Hospital of Japanese Foundation for Cancer Research, 3-8-31 Ariake, Koto-ku, Tokyo 135-8550, Japan. Cancers arising from the gastrointestinal tract, including esophagus, stomach, colorectum, liver, gallbladder and pancreas, are frequently observed all over the world. Recent progress in molecular biological techniques facilitated understanding of the mechanism of cancer development and progression. 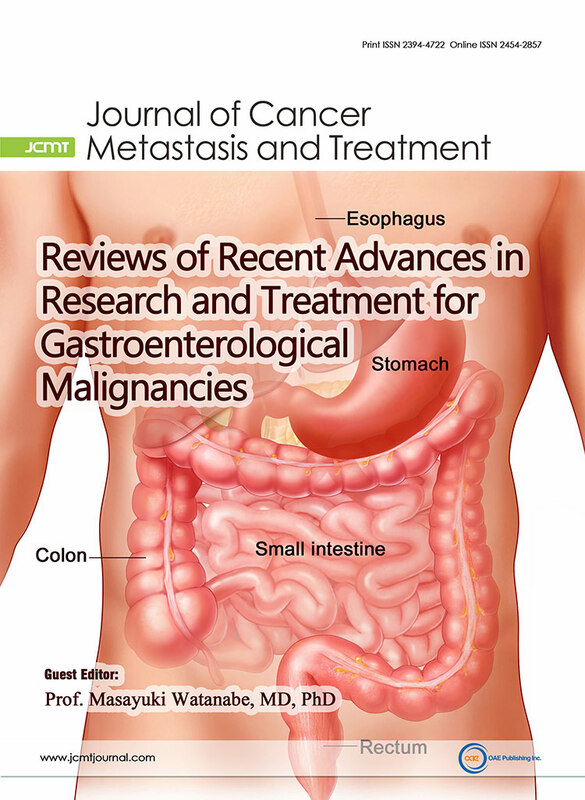 This issue contains 9 review articles concerning the topics attracting a lot of attention in the field of gastrointestinal malignancies. J Cancer Metastasis Treat 2015;1:111-2. Epigenetic alterations, including DNA methylation, histone modification, loss of genome imprinting, chromatin remodeling and noncoding RNAs, are associated with human carcinogenesis. Among them, DNA methylation is a fundamental epigenetic process to modulate gene expression. In cancer cells, altered DNA methylation includes hypermethylation of site-specific CpG island promoter and global DNA hypomethylation. Detection of aberrant gene promoter methylation has been applied to clinic to stratify risk in cancer development, detect early cancer and predict clinical outcomes. Environmental factors associated with carcinogenesis are also significantly related to aberrant DNA methylation. Importantly, epigenetic changes, including altered DNA methylation, are reversible and thus, used as targets for cancer therapy or chemoprevention. An increasing number of recent studies reported DNA methylation level to be a useful biomarker for diagnosis, risk assessment and prognosis prediction for gastrointestinal cancers. This review summarized the accumulated evidence for clinical application to use aberrant DNA methylation levels in gastrointestinal cancers, including colorectal, gastric and esophageal cancer. J Cancer Metastasis Treat 2015;1:113-22. Esophagogastric junctional adenocarcinoma is commonly treated as esophageal adenocarcinoma (EAC), and has dramatically increased in Western countries for several decades. The similar trend has been observed in Asian countries (not in China). Barrett's esophagus (BE) is a widely accepted precursor of EAC. Recent advances of next-generation sequencing could provide researchers with a better understanding of genetic and epigenetic alterations in the carcinogenesis of EAC. In this review, we have summarized the recently reported major genetic and epigenetic alterations in both BE and EAC. Sonic hedgehog/bone morphogenetic protein axis, which is a key signaling for esophageal development, plays an important role in BE intestinal metaplasia. Single nucleotide polymorphisms related to esophageal organogenesis, such as FOXF1 and FOXP3, are frequently detected in BE patients. During progression of BE to adenocarcinoma, lacking of normal function of TP53 and CDKN2A by loss of heterozygosity (LOH), mutation, or promoter methylation has been frequently observed. LOH at 9p (coding CDKN2A) is an earlier event to EAC carcinogenesis compared to that at 17q (coding TP53) LOH. In order to further elucidate the pathogenesis of BE and EAC, it will be necessary to analyze these genetic/epigenetic alterations in combination with clinical data in a large-scale cohort. J Cancer Metastasis Treat 2015;1:123-9. Circulating tumor cells (CTCs) are originated from the primary tumor lesion into the blood stream. CTCs could lead to recurrence of gastrointestinal (GI) cancers, even after a curative resection and colonizing in the distant organs to facilitate tumor distant metastasis; however, it has been challenging in clinic to detect CTCs for a long time, such as detection methodology or molecular markers for identification of CTCs. This review discussed the recent technical advances and biomarkers in the detection of CTCs and the molecular mechanism of CTC in cancer progression and metastasis. Moreover, novel concepts, such as cancer stem cells and epithelial-mesenchymal transition, could lead to CTCs and tumor progression and metastasis. Nevertheless, the involvement of CTCs varies greatly among cancer types in the GI and much remains to be learned. Thus, further study will provide more insightful information from a clinical and translational viewpoint to use CTCs for cancer early diagnosis or prediction of tumor recurrence and investigation of tumor progression and metastasis as well. J Cancer Metastasis Treat 2015;1:130-7. Chronic inflammation has been identified as an important risk factor in development of the gastrointestinal (GI) tract cancers and the underlying molecular mechanisms have been studied extensively. Chronic inflammation is able to trigger cellular events to promote malignant transformation of normal epithelial cells in the gastrointestinal tract to cancer. Host inflammation responses in carcinogenesis are through multiple mechanisms, such as reactive oxygen and nitration species from mononuclear phagocytes and leukocytes, immune response, and pro-inflammatory cytokines. Nuclear factor κB(NF-κB) has been considered as the central mediator of the immune response. Activation of NF-κB by phosphorylation leads to translocation of NF-κB protein to the nucleus and in turn regulates transcription of several pro-inflammatory cytokines and chemokines. Furthermore, chronic inflammation creates an environment forgenomic and epigenetic changes. In this review, we summarize important molecular mechanisms that link chronic inflammation and GI tract cancer, including esophageal, gastric and colonic cancers, focusing on infective and noninfective agents such as gastroesophageal reflux disease, Helicobacter pylori gastritis and inflammatory bowel disease. Gastrointestinal (GI) cancers remain one of the most common malignancies and are the major cause of cancer deaths worldwide. Significant advancements have improved our understanding of the pathogenesis and pathology of GI cancers, but high mortality rates, an unfavorable prognosis, and lack of clinical predictive biomarkers provide an impetus to investigate novel diagnostic/prognostic markers and therapeutic targets for GI cancers. MicroRNAs (miRNAs) are short (19-24 nucleotides), non-coding RNA molecules that regulate gene expression at the post-transcriptional level, thus playing an important role in modulating various biological processes. This includes developmental processes, proliferation, apoptosis, metabolism and differentiation, all involved in initiation and progression of various human cancers. Aberrant miRNA expression profiles have been observed in various cancer types at different stages, suggesting their potential as diagnostic and prognostic biomarkers. Due to their tumor- and tissue-specific expression profiles, stability, and the availability of robust clinical assays for their detection in serum as well as in formalin-fixed tissue samples, miRNAs have emerged as attractive candidates for diagnostic and prognostic applications. This review summarizes recent research supporting the utility of miRNAs as novel diagnostic/prognostic tools and therapeutic targets, thus potentially illuminating future treatment strategies for GI cancers. J Cancer Metastasis Treat 2015;1:144-55. Colorectal cancer remains a signiﬁcant cause of cancer-related mortality worldwide, mainly because of tumor relapse and metastases. Cancer stem cells (CSCs) are considered to be the main cause of resistance to chemotherapeutic agents, as well as being responsible for distant metastases. Although CSCs themselves possess innate abilities for self-renewal and differentiation, the environment surrounding CSCs provides oxygen, nutrients and secreted factors, and also supports angiogenesis, thus it's responsible for maintaining their CSC properties. Furthermore, extensive investigations have revealed that obesity, accompanied by excess visceral adipose tissue, induces chronic inﬂammation, and is linked to the risk and progression of several gastrointestinal cancers, through modulating the capacities of the CSCs. This review presents the evidence linking colorectal CSCs and their environment and summarizes our current understanding of the molecular mechanisms underlying this relationship. J Cancer Metastasis Treat 2015;1:156-62. Targeted drugs therapies that block the molecular pathways involved in the development and progression of gastro-intestinal (GI) cancers have recently gained considerable attention. In addition to agents targeting vascular endothelial growth factor (VEGF), epidermal growth factor receptor, the multi-kinase inhibitor, and regorafenib have also become available for the treatment of metastatic colorectal cancer patients. Currently, trastuzumab, an antibody targeting human epidermal growth factor receptor-2 (HER-2), in combination with cytotoxic drugs is considered as the standard treatment for patients with HER-2 positive gastric cancer (GC). The efﬁcacy of ramucirumab, a human monoclonal antibody that inhibits VEGF from binding to its receptor in GC, has also been recently demonstrated. At present, a great number of novel targeted drugs are in pre-clinical or clinical studies. In this review, we summarize trends in the use of molecularly targeted drugs that have proven to be effective for treating GI cancers, with a focus on emerging strategies for personalized treatment. J Cancer Metastasis Treat 2015;1:163-71. Cancer cells exhibit altered glucose metabolism, mitochondrial dysfunction, anaerobic glycolysis, and upregulation of the pentose phosphate pathway (PPP). Recent genetic and metabolic analyses have provided insights into the molecular mechanisms of genes that are involved in alteration of cancer metabolism and tumorigenesis. Hypoxic induced factor 1 regulates the reciprocal relationship between glycolysis and oxidative phosphorylation, and p53 also modulates the balance between the glycolytic pathway and oxidative phosphorylation. Mitochondria function in cancer differs from that in normal cells owing to mutations of mitochondrial DNA and alterations of metabolism. Overexpression of transcription factors, metabolite transporters, and glycolytic enzymes is observed and associated with poor prognosis, and it may be associated with chemoradiotherapy resistance in multiple cancer cell types. The PPP plays a critical role in regulating cancer cell growth by supplying cells with ribose-5-phosphate and nicotinamide adenine dinucleotide phosphate for detoxification of intracellular reactive oxygen species (ROS), reductive biosynthesis, and ribose biogenesis. ROS levels increase during carcinogenesis owing to metabolic aberrations. This review discusses alterations of mitochondrial metabolism, anaerobic glycolysis, the PPP, and control of ROS levels by the endogenous antioxidant system in cancer, as well as the novel small molecules targeting these enzymes or transporters that exert antiproliferative effects. J Cancer Metastasis Treat 2015;1:172-82. Epithelial-mesenchymal transition (EMT) was first reported as an essential process in embryonic cells and later showed that cancer cells, regardless of the context, exhibit a similar phenomenonthat is crucial for tumor progression. Epithelial cells lose their adhesive characteristic capacity which is necessary for their functions but gain a mesenchymal phenotype. This change from epithelial to mesenchymal phenotype of cancer cells makes it difficult tounderstand the mechanism underlying cancer biology and tumor progression. A number of transcription factors involved in tumor cell EMT and miRNA-regulated EMT have been reported. This review discussed recent findings and new players in EMT in gastrointestinal cancers. Since the molecular mechanisms of tumor progression are sometimes context dependent, the recent findings of EMT have been reviewed in the context-dependent manner. J Cancer Metastasis Treat 2015;1:183-9.